Sinn Fein Foyle MLA Raymond McCartney. A Sinn Fein MLA for Foyle has condemned those behind leaving a bomb at a Derry Hotel where a PSNI recruitment event was due to take place. Police had said initially that the device had been an “elaborate hoax” but have now said that following an examination by British army bomb disposal that the device was a viable Improvised Explosive Device. The police recruitment drive had been scheduled to take place today, Saturday, October 10, at the city’s Waterfoot Hotel. 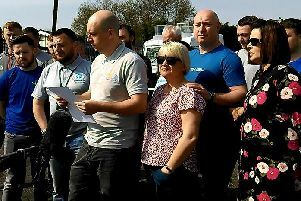 The PSNI however had already postponed the event on Thursday past following an appeal by a couple whose wedding reception will take place there today. The Republican Network for Unity had stated their intent to protest outside the Derry event. On Friday, October 9, security alerts also took place at the two other locations in the North where police recruitment drives were due to take place. However police have said that those events at Omagh’s Strule Arts Centre and Belfast’s Metropolitan College will go ahead today. The PSNI say the Derry recruitment event will go ahead next Saturday, October 17 at the same venue. Condemning the incident in Derry, Sinn Fein’s Raymond McCartney who sits on the Stormont Justice Committee said: “Those responsible for this bomb have nothing whatsoever to offer the people of Derry. “Not only have they brought disruption to the city, they have also endangered the safety of hotel staff, guests, customers and passers by. “Their reckless actions are so far out of touch with the views of the vast majority of the people of Derry. “They need to listen to the voice of the people and end these futile actions immediately.